Om is a single-syllable mantra, a sacred chant, known as a bija – a seed mantra. Just as a tiny seed embodies a wondrous tree, in yoga, it is believed that the one-syllable sound of Om contains the infinite spiritual wisdom and creative power of the Universe. Humming the sound of Om reverberates in a manner that leads to us towards the experience of the infinite within us. Patanjali, the father of classical (Raja) yoga, taught us in the Yoga-Sutra that when we chant this sacred syllable and simultaneously contemplate its meaning, our consciousness becomes single-pointed and prepared for a meditation in which our true nature is revealed. We embody sacredness. There are 3 primary sounds of Om, which represent the 3 primary states of our being – a, u, and m. Each of these three parts serve as meditative seeds. “Ah” represents our waking state, which is our subjective consciousness of the outer world. “Oh” represents our dreaming state, or the consciousness of our inner world of thoughts, dreams, and memories. “Mmm” is the dreamless state of deep sleep and the experience of ultimate unity. By contemplating the meaning of each of these sounds as we hum them, we are led through the three states of our ordinary consciousness. There is however a fourth part of Om, too: the anusvara, the after-sound of silence. This silence is the crown of the mantra. After chanting or humming the 3 primary sounds of Om, the vibration slowly dissolves into silence, symbolic of the transcendent state of consciousness, an enduring, blissful state, where the seed of our being is fully expressed. 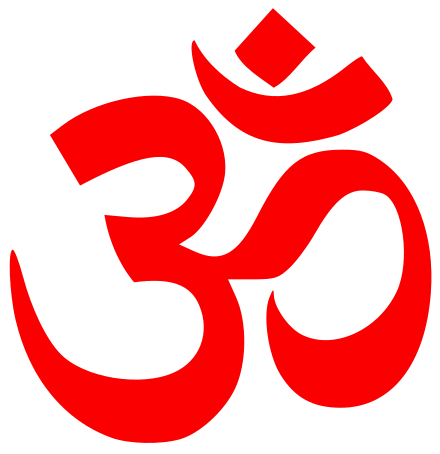 The symbol of Om represents these states; the 3 bottom curves each represent the 3 primary states of waking (lower left), dreaming (lower right, and between waking and deep sleep symbols), and deep sleep (upper left); and the top dot represents the absolute state. The curve below the dot (and not touching dot) represents maya, the veil of illusion that gets in the way of our spiritual development and realization of the absolute state. We chant Om at the beginning of yoga classes to remind us of the sacredness of our practice. It brings attention to the present-moment aspects of our awakened practice, paying attention with all of our senses. It also offers a doorway through which we explore our other states of being and our true nature. The question is, in our daily lives where we interact with one another, are we in our waking-state or our dreaming-state? As in yoga, when we learn to pay attention to what is really going on in each moment, not caught in day-dreaming, worrying, planning, or just repeating habits and re-living memories, we start to awaken. We start to see. We start to see truths with more clarity. We start to see the interdependence of all things from an ever-expanding perspective. And we start to understand the unity of all things and see the jewels of life in every aspect of our existence. And we start to understand and experience the chanting of Om, the seed of our being awakens, our consciousness expands, and the infinite spiritual wisdom and creative power of the Universe is unleashed! “The gentle breezes of dusk and dawn have secrets to tell you. That door is round and open. This entry was posted in One Perspective, Yoga and Mindfulness by Bob Speck. Bookmark the permalink.